After Alexei Yagudin's mother and uncle spotted a poster on a wall in Leningrad vaunting the healthy benefits of figure skating, the four-year-old's destiny had been decided. The decision paid off handsomely at the Salt Lake Winter Games where Yagudin performed brilliantly to win the Olympic title ahead of his great rival and compatriot Yevgeny Plushenko. While his mother had no idea her son had any special talent for skating, the respected Russian coach Alexei Mishin thought otherwise when he spotted the youngster when he was 12. Under the guidance of the wily Mishin, who coached Alexei Urmanov to the Olympic title in 1994 at Lillehammer, Yagudin's progress was spectacular, and before long he had developed into an exceptionally promising skater with an impressive repertoire of jumps. 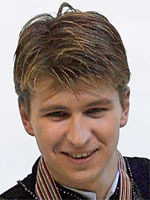 After winning a bronze medal at the 1997 world championships, the Russian was crowned European champion a year later, and set out for the Nagano Olympics in 1998 as a firm favourite to win a medal. However, a bout of flu undermined Yagudin's preparation in Japan and he was still feeling under the weather when it came to the competition, which no doubt contributed to his disappointing fifth place. Back to full strength a few weeks later, Yagudin won the first of his four world titles aged just 18 years and 15 days. His winning rhythm was considerably disrupted, however, by the arrival within the Mishin camp of another skater, Plushenko. An intense rivalry began between the two men and it was not long before Yagudin was packing his bags and heading for choreographer Tatiana Tarassova. The experienced Tarassova immediately identified the artistic aspect of Yagudin's performance as his weak area and set to work to beef it up. Despite these improvements, Plushenko was matching him jump for jump. "To become champion, I will have to do at least two quadruples," he said. As it turned out, he successfully completed three quads and the gold medal was deservedly his. To cap a perfect 2002 season, just weeks after the Olympics Yagudin won his fourth world title to go along previous triumphs in the European's and Grand Prix finals. Injuries hampered his career following Salt Lake and would eventually lead to his retirement in 2003.